Do you know how to recover files from external hard drives? External hard drive recovery is the process of recovering lost data from external hard drive, for example, recover deleted files, retrieve lost data from formatted external HDD, restore RAW drive, etc. In this guide, we discuss data loss scenarios, causes, ways to recover files from external hard disk and how to avoid data loss. When you encounter data loss issue, you can read this instruction and get data back easily and completely. 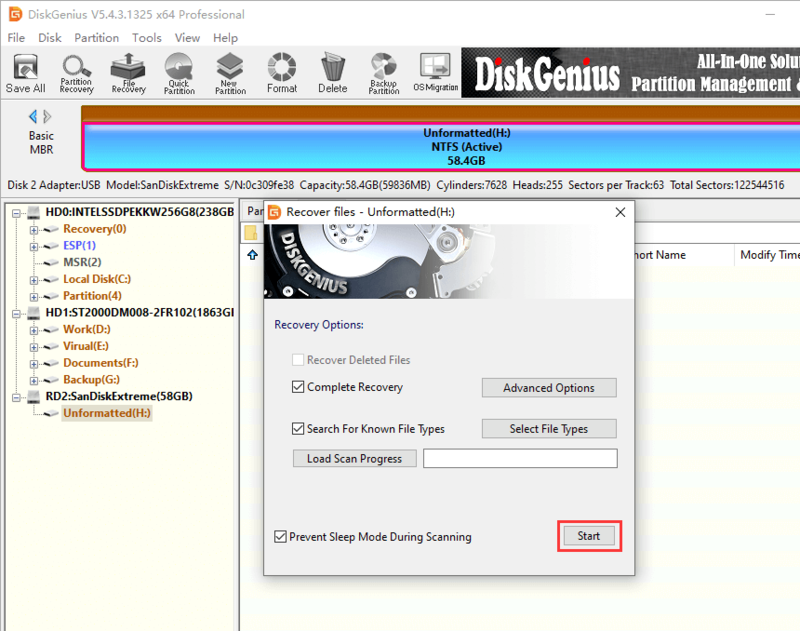 DiskGenius - Efficient external HDD recovery software to recover deleted, formatted or lost data completely. How to avoid data loss from external hard drive? External hard drive is very useful storage device which is able to store all kinds of data such as photos, music, video, working files, study materials, etc. An external hard drive is actually an average hard drive placed with a SATA/USB connector or enclosure. It provides huge amount of storage capacity and it is portable, which brings about great convenience. We can carry terabytes of data everywhere we go, share data among various machines, backup data, etc. Besides, it is very easy to use, for we can access it by connecting it via computer USB port. In the big data era, a lot of data is generated every day, and we need to access or store data every day. When computer hard drive is running out of space, external hard drive will be the choice for many users to store extra data. Whereas, is it really safe to keep data on external disk? Many times, you store files on external drive in order to keep a backup. However, it's easy to forget to keep multiple copies for backup. Thus, external hard drive becomes the only copy of your data, and it is no longer a backup. In this case, once data on external hard drive gets lost due to deletion, formatting, virus attack, etc. you'll have to perform external HDD recovery. Is it possible to recover lost data from external hard drive? It is theoretically possible to get back lost data from external HDD and other devices. Windows does not wipe data immediately when it deletes or formats in general way. Lost files or partitions can be completely restored as long as they are not overwritten by newly stored data. As to how to do external HDD recovery, the easiest method is using effective HDD recovery software and following correct guide. The rest part of this guide will discuss how to deal with different data loss issue. Accidental deletion of important data: Unlike internal/local hard drive, files deleted from removable disk are not put into Recycle Bin. Thus, if you delete a file from external disk by mistake, you cannot restore it from Recycle Bin. Without proper recovery method, you may lose the file forever. Formatting disk by mistake: Users are allowed to format any partition except system drive, and external disk might be formatted by mistake. Also, some users format partition for the purpose of changing file system format and making the disk accessible under different platforms. Partition loss: Partitioning an external hard drive which contains partition may remove all partitions and data; deletion of wrong partition also causes data loss; partition table corruption causes partition loss, as well. RAW drive: partition on external hard drive becomes RAW, unformatted or inaccessible and reports error message such as "Disk is not formatted. The disk in drive G is not formatted. Do you want to format it now?" This issue can appear if there is a sudden power failure when system is writing data to the disk or the USB disk is removed without clicking the "Safely Remove Hardware and Eject Media"
Disk bad sectors: bad sector can be caused by various reasons such as quality issue, used for long time, frequent power off, vibration, etc. If a disk contains bad sectors, it slows down or even freezes. Severe physical damage: some symptoms indicate disk gets severe physical damage, such as the hard drive not showing up in computer, it makes noises after connecting to computer. Do not be panic no matter what data loss issue you encounter, all you need to do is avoiding data overwriting in the first place. Then download external HDD recovery software and start recovery following guide here. Eassos Recovery Free is free external HDD recovery software which retrieves files from formatted, inaccessible, RAW or corrupted disk. It is designed with a recovery wizard which guides through the recovery process step by step. Apart from lost & RAW partition recovery, deleted file recovery is available for external disk. It supports recovery of data from FAT, FAT32, exFAT32 and NTFS drive. The tool is free of charge and it is user-friendly. However, if you need to handle complicated issue you need to use professional recovery software DiskGenius. 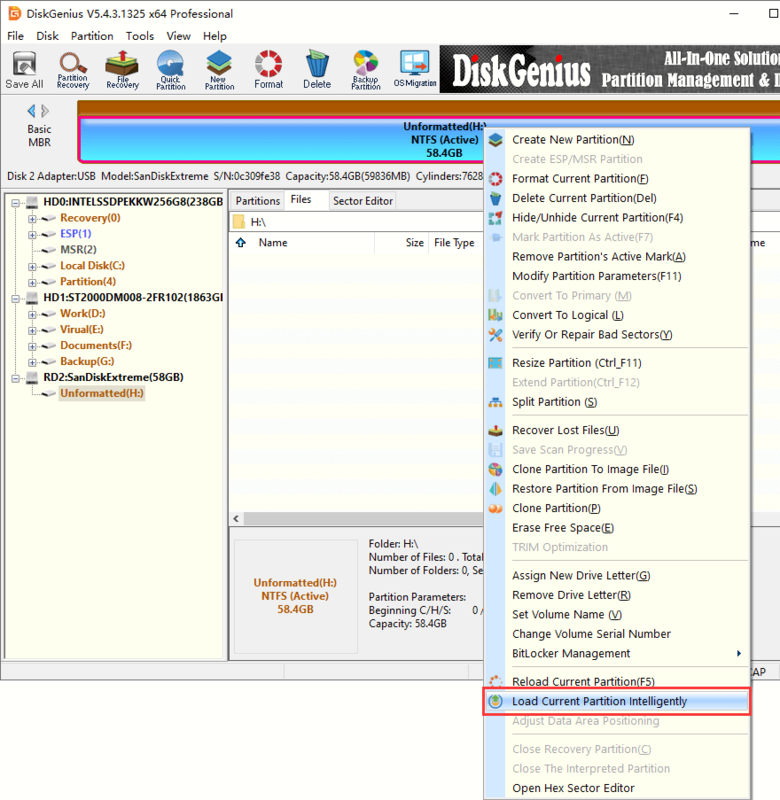 DiskGenius is proficient external hard drive data recovery software which enables you to recover deleted files, recover data from disk that are formatted, corrupted, inaccessible, etc. 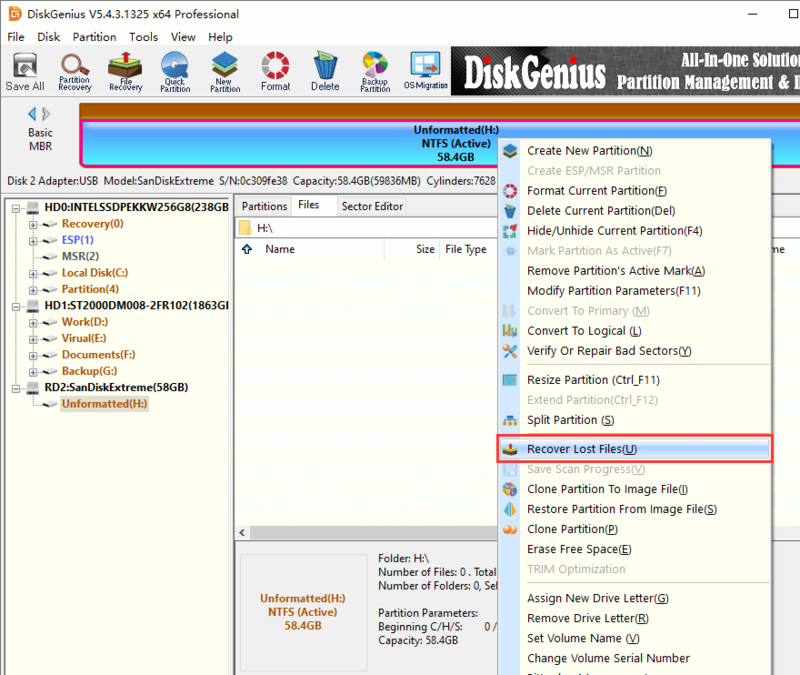 restore lost or deleted partitions. 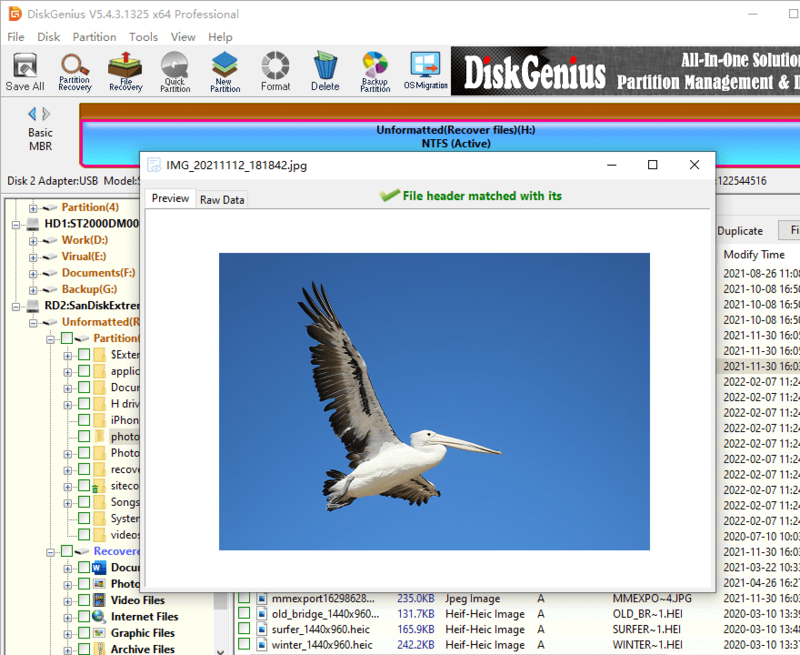 The advanced algorithm can load files from corrupted NTFS files quickly and search for lost partitions from various devices. Moreover, hex editor is provided to help users edit RAW data such as MFT on external hard drive, making data recovery more efficient. Multiple devices are supported such as hard drive, external hard drive, SSD, virtual disk, SD card, USB flash drive, etc. Therefore, you can perform hard drive recovery, external HDD recovery, SanDisk data recovery, etc. Supported file system: NTFS, exFAT, FAT32, FAT12, FAT16, EXT2, EXT3, EXT4. Operating system: Windows 10/8.1/8/7/Vista/XP, Windows Server 2016/2012/2008/2003. 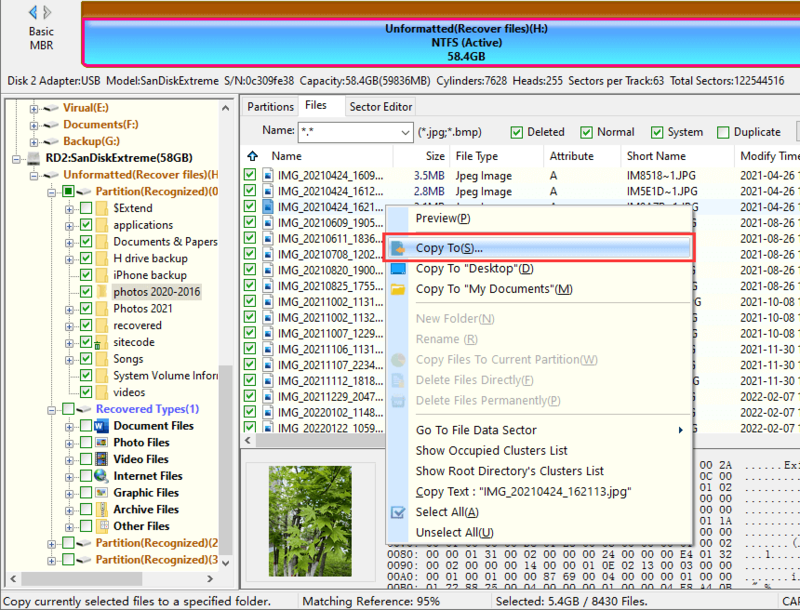 In this example, you can see how to recover deleted, lost or formatted data from external HDD. To maximize recovery result, you should make sure there is not data overwrite after data loss. Connect the external disk you want to recover data, and then follow the guide to recover data from external hard disk. Step 1 Install and launch external HDD recovery software from your computer instead of the external disk that needs recovering data. Step 2 Right-click on the external disk and choose Recover Lost Files from the context menu, as below. Also, you can select the partition that loses data and click File Recovery button from toolbar. Step 3 Select recovery mode and click Start button to scan your external drive for lost data. There are three options here and you can select based on your data loss issue. If you are not sure which one should be chosen, then follow default settings. Step 4 Preview files and find out what you want to recover. Lost files and folders are displayed as soon as they are found by the software and listed files keeps increasing during scanning. You can preview files in scanning result to check if files are correct. Step 5 Select files and folders you want to recover, right-click on select data and select Copy To. Then you can specify a location to save these files. Partition on external hard drive turns to RAW format, which is one of the common data loss issue users often encounter. In general, external hard drive is formatted as NTFS file system by default in Windows. RAW format is not a correct file system format and RAW drive cannot be accessed by Windows. If partition on your hard drive or external HDD becomes RAW or unformatted, you cannot open it in File Explorer and get error message such as Location is not available. H:\ is not accessible. The file or directory is corrupted and unreadable. RAW partition does not mean the partition is lost and it is just corrupted and files are not gone. Let's have a look how to do RAW drive recovery. Step 1 Connect RAW external HDD to computer and launch DiskGenius. Then you can view the drive in the software and it is Unformatted. 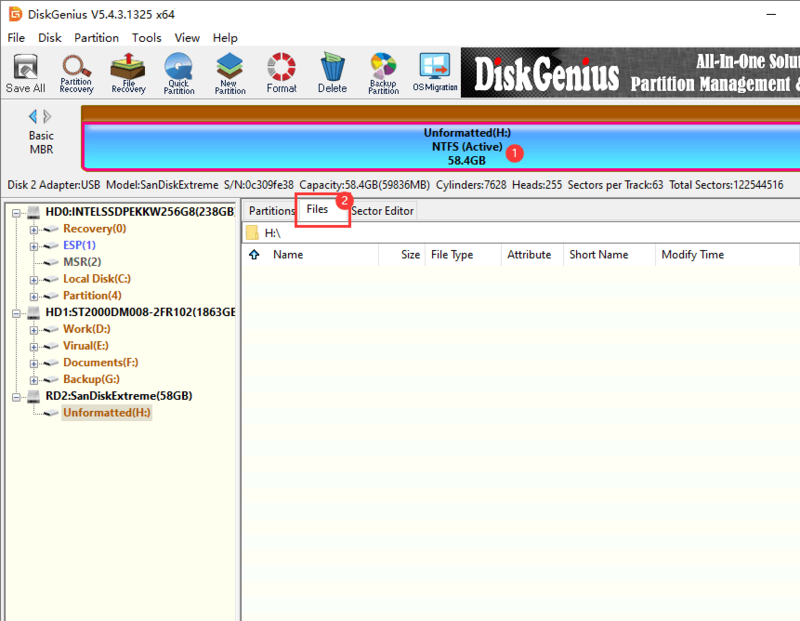 Step 2 Select the RAW partition in DiskGenius and click Files tab as follow, then check if files in the drive can be displayed directly. If files can be listed in this way, you can copy and save files you need to a different disk. If not, move to next step. Note: this function works on corrupted NTFS partition which is not damaged that much. In many cases, it is able to load files and folders of RAW drive without doing any scanning. If your files can be listed by this function, you can copy and save files to another drive to get them recovered. If your drive is damaged too badly, this function won't work and you need to scan the drive completely, as in Step 4. Step 4 Right-click on the RAW drive and select Recover Lost Files option. Then you can carry out a complete scanning for the RAW partition and look for recoverable files. Step 5 When scanning completes you can preview recoverable files listed in scanning result. Then select what you want to recover and save them to a different location. When your external HDD becomes inaccessible or RAW format, you may be asked by Windows to format the drive. If you google this issue, you may find some guide may suggest running chkdsk to repair damaged file system. However, in fact, none of those methods can improve the situation if the RAW drive contains important data. The correct sequence is recovering data prior to any repairing actions. Protecting data against loss or damage is the better choice to ensure data safety. Though you can try data recovery with efficient recovery software, it is equally important to avoid data loss. Here are some aspects that needs your attention to keep away from external data loss. Use qualified external hard drive. Purchase external hard disk from legitimate local or online shop to make sure the disk is not fake. Take good care of the disk. Keep it away from moisture, high or low temperature, dropping and other damages. Always removes it properly. When you want to disconnect external hard drive from computer, always remember to click Remove Device option first. If you remove external hard drive or other USB disks directly without clicking the option, you are likely to get RAW drive. Install anti-virus software. Virus or malware is one of the main causes of data loss for both computer and external devices. It important to install antivirus software and scan your disk in regular. Understand the signs disk failure. The hard disk might be damaged such as bad sectors if computers slows down or freezes after connecting to computer. Backup data. Try to keep at least 2 backup copies for your data. You can backup data to hard drive, USB disk, NAS drive, cloud drive, etc. In conclusion, external hard drive recovery is easy to realize and most users can complete the task on their own. DiskGenius can help you get back lost data as long as it is not overwritten. To avoid data loss, you may need to keep at least 2 copies of backup for important data. Always keep calm when facing data loss issue and follow this guide to achieve a satisfying result. If you need any help regarding external hard drive data recovery, please feel free to contact our tech support team. DiskGenius - Effectively recover lost or deleted photos, audio, documents, music, emails from external HDD.